This article is more suited to experienced investors. Profits are all important when it comes to investing in companies. To make money over the long haul it usually helps to invest in a company that is growing its profits. The more profitable a company is, the more valuable its shares tend to be. However, profits have to be believable. Can you really trust the profit numbers disclosed in a company’s accounts? In most cases you can but in quite a few cases you can’t be too sure. For some companies, profit is not a simple mathematical calculation of income less costs but more a case of what the management wants it to be. By this I mean that it’s not unheard of for companies to paint the rosiest possible picture of their profits by ignoring significant costs. Sometimes loss-making companies will ignore certain one-off costs in order to post a profit – affectionately labelled by more scrutinising investors as profits before the bad stuff. This article looks at how companies tell investors how profitable they are and how you can work out whether that is reasonable or not. Reported profit – this is revenues minus all costs such as operating expenses, finance costs and tax plus any one-off gains. Adjusted or underlying profits – revenue minus normal or underlying costs. This figure ignores one-off or exceptional gains and costs. It can also be called normalised profits. Reported profits include the underlying trading profits of a business plus every one-off gain and cost. Underlying profits exclude the gains and costs that the company chooses. This means that a company has significant leeway in telling investors what its true underlying profits really are. Companies want investors to focus on their underlying profits. This means that they want you to ignore the exceptional or one-off costs which reduce reported profits. That doesn’t sound too unreasonable to many people as they want to look at the underlying trading performance of a business without one-off costs and gains muddying the waters. I understand this, but ignoring the impact and meaning of exceptional costs can be a mistake. The most common measure of adjusted or underlying profits is often referred to as profits before amortisation and exceptional items. Amortisation is the spreading of the cost of intangible assets such as brands, patents, IT costs and customer relationships over their useful lives. These are real costs of doing business and should not be excluded from underlying profits. Amortisation of acquired intangible assets are not a regular cost of business and can be excluded in my view. Pre-opening costs or start-up losses. These costs can be very large and often lead to companies reporting a loss. If the costs are genuinely one-off and non-recurring then it is not unreasonable for investors to ignore them when working out a company’s underlying profits. However, the use of exceptional costs can be abused by companies. This is often the case where management teams are paid bonuses based on their underlying rather than reported profits. It shouldn’t surprise anyone that they will be incentivised to make their underlying profits seem as big as possible. It seems that exceptional costs for some companies aren’t really one-offs at all. They can be a regular occurrence. If that wasn’t bad enough, exceptional costs can also be used to boost future profits by pulling the wool over investors’ eyes. In my opinion, too many investors ignore the real cash outflows caused by some exceptional costs and are blissfully unaware that future profits can also be inflated by them without any increase in cash flows. The profit improvements can therefore be illusionary thanks to a stroke of the accountant’s pen. This may help to pay management bonuses but the shareholders do not become better off. One of the simplest tests you can do as an investor is compare a company’s reported profits with its underlying profits. If there is a big gap between the two numbers due to large exceptional costs then you need to satisfy yourself that nothing dodgy is going on. 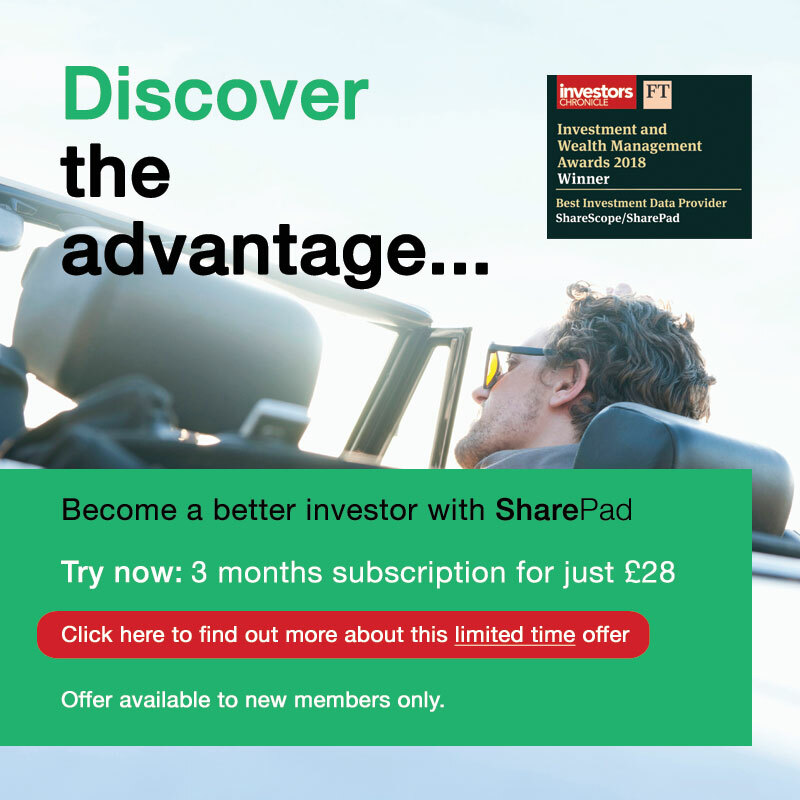 You can check the gap between the two profit numbers in SharePad using a chart. 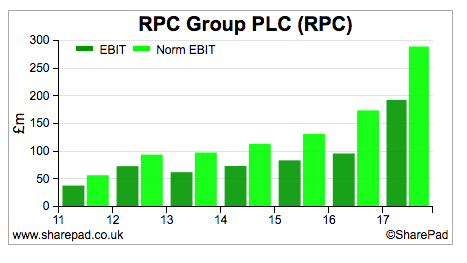 Below is a chart for plastic packaging company RPC (LSE:RPC) where the gap between them had been getting bigger. The other useful thing to do is to look at the size of exceptional costs as a percentage of underlying profits. As you can see for RPC, exceptionals have been very large in recent years. Although its half year results for 2017/18 has seen this percentage fall dramatically. These costs may be perfectly legitimate but the sheer size of them does give the company considerable scope to make its underlying profits seem as big as possible in my opinion. The company has spent a lot of money buying companies in recent years and has allocated lots of exceptional operating costs to them as shown below. I think it’s fair enough to ignore £31m of amortisation on acquired intangibles. The costs associated with acquisitions do seem eye-wateringly big though. Whether these are truly exceptional or not it shouldn’t be ignored that this is money that cannot end up in shareholders’ pockets. Just how profitable was Revolution Bars between July and December 2017? When you come across a company where its results are distorted by large exceptional costs, you need some way of working out how profitable the company really was. Don’t just take the company’s word for it. Last week, premium bar operator Revolution Bars (LSE:RBG) released its half year results. They contained lots of exceptional items which amounted to the same amount of money as its total operating profits for its previous financial year – £9.6m. I think trading or operating profit is the best measure of profitability to focus on as it shows how profitable a company is from selling its goods and services. It is not affected by the amount of debt interest payments or tax expenses. 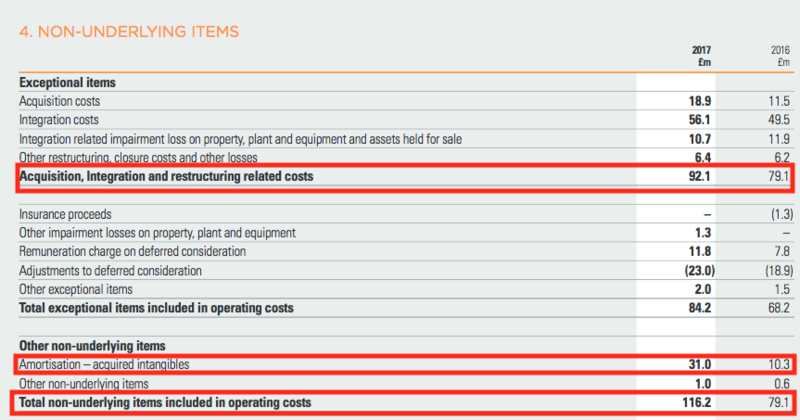 As you can see below, there are big differences between RBG’s reported and adjusted operating profit. If all costs are included, the company made a loss of £3.72m compared with a profit of just over £5m a year earlier. However, the results contained £9.56m of exceptional expenses and also £936k of new bar opening costs. The company says that the bar costs are non-recurring, but there were £843k of them in the same period last year. There is also an adjustment for share based payments where a credit is used to reduce adjusted operating profit by £765k. If the exceptional items and new bar opening costs are ignored then adjusted operating profit actually increased slightly to just over £6m. As far as the company is concerned it seems that things aren’t so bad after all. Let’s take a closer look at the £9.6m of exceptional items. If I was very generous then I could accept that all of these costs are one-off and non-recurring. However, some of them arguably represent a bad use of money. They include £2.2m for professional fees and £705k for paying off the previous chief executive and chief operating officer which is painfully expensive and a real cash loss. The same can be said for the £169k of fees paid to accountants because the company wasn’t measuring the value of its property assets properly. I think it’s right for investors in any company to ask whether it is reasonable that over £3m of cash spent on fees and payoffs should be excluded from the calculation of their bonuses? I recently raised the issue of bar opening costs when looking at City Pub Group which provoked some lively debate on Twitter. In terms of the bars concerned they are non-recurring but in my view they are an ongoing cost of doing business for a company whose strategy is to grow its sales and profits by opening new bars. The impairment of property assets, and the very large provision for onerous leases, do not represent outflows of cash but contain a very serious message for investors. The provision for onerous leases is telling them that the company has some loss-making bars. The asset impairments are saying that some bars are not worth as much as they were previously stated on the balance sheet. I’ll have more to say on these two issues shortly. It’s largely up to you how you want to interpret exceptional items and whether they are really one-off or not. My view is that when an income statement is heavily distorted by them as is the case with Revolution Bars you can run into difficulties with determining just how profitable a business really is. For me, this is just another reason why investors should pay less attention to the profit figure in the income statement and spend more time looking at trading or operating cash flow instead. However, operating cash flow should not be seen as a measure of cash profit for reasons I will now explain. 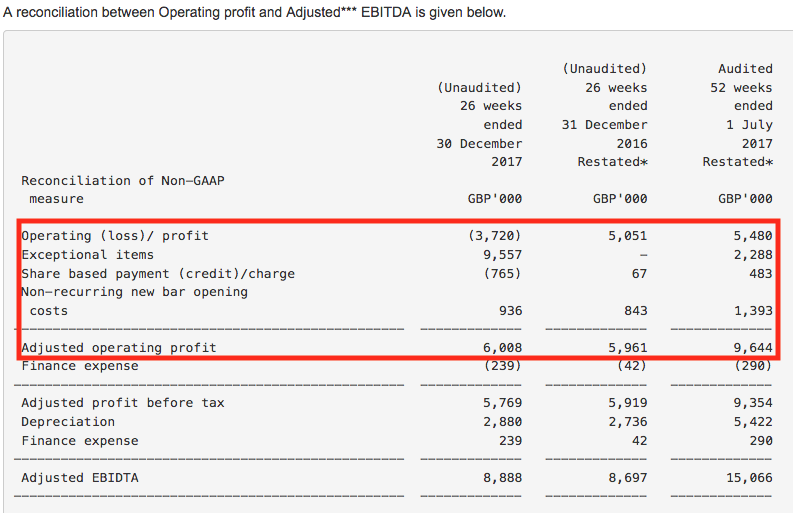 Some investors will take heart from the fact that net cash from operating activities has increased from £6.25m to £7.11m. But this is not the same as cash profits. This is because there is a £2.38m inflow from working capital (the changes in stocks, trade debtors and trade payables) compared with a £1.86m outflow last year – a positive swing of £4.24m. It’s important to pay attention to changes in working capital as it can alert you to changes going on in a business. But working capital flows reflect the timing of cash flows in relation to revenues and costs, they are not changes to profits. A better starting point is to look at operating cash flow before the effects of working capital. 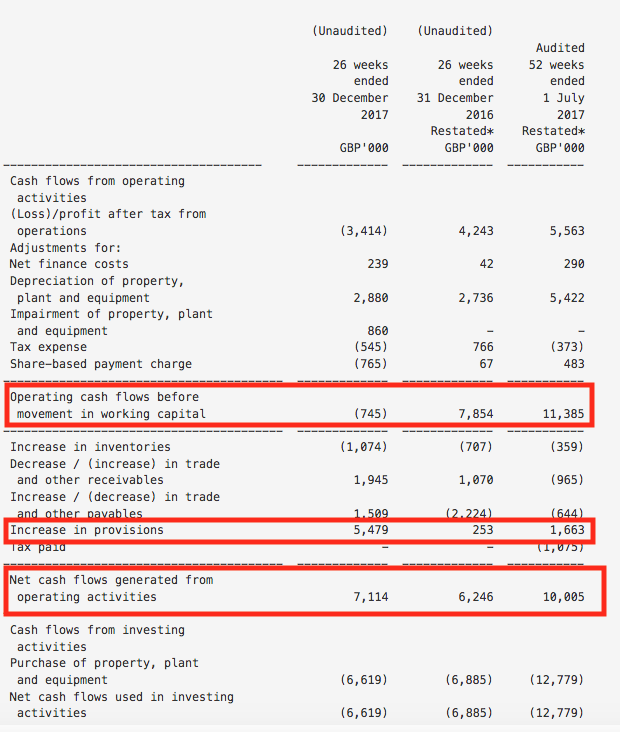 If we look at operating cash flows before working capital there is a £745k outflow compared with a £7.85m inflow. This outflow includes the cash outflows associated with fees and bar opening costs but it excludes the increase in provisions which are a non-cash cost. Before we do this, let’s look at the issue of share-based payments. Revolution Bars thinks they should be ignored when calculating its adjusted operating profits. It is true that they are a non-cash cost but they are a cost all the same and should be treated in the same way as wages in my opinion. Share-based payments actually reduce RBG’s own underlying profit figure by £765k. However, this is a net figure as it includes £358k expense and a one-off gain of £1.1m from options to former management lapsing. The £765k net credit is shown as a reduction in operating cash flow before working capital because it did not represent a flow of cash. However, to get a sensible measure of profitability we need to include the regular expense of £358k. Let’s look at what profits might look like after we make a few adjustments. Start with operating cash flow before working capital changes. Add back the increase in provisions. Take away the share-based payment expense. This gives an estimate of reported EBITDA. Add back fees and CEO payoff to get underlying EBITDA. Take away depreciation to get underlying operating profit. Now let’s compare my figures with the company’s. I have gone about calculating profits using quite a lot of steps. I have done this deliberately to highlight the issues and processes involved which hopefully shows how I arrived at my estimates. You could have quickly got to a similar figure by taking the company’s adjusted operating profit figure of £6.008m and then deducting £936,000 of bar pre-opening costs and £358,000 of share based payments to get a figure of £4.714m. I can understand why readers could see me as being a bit picky here. That said, the cash cost of exceptional items is a loss of value away from the owners of the business. This may not be a large amount of money in terms of absolute value but it contains an important view on how the business has been run. The overriding point I want to make here is do not blindly accept a company’s version of adjusted profit. Try and consider whether exceptional and non-underlying items are reasonable and make up your own mind. You may end up agreeing with the company but you might not and this might make the difference as to whether you invest in a company or not. We can quibble about the effect on past profits of exceptional items but there can be no disputing that the reduction in the value of property, plant and equipment assets and the provision for onerous leases will boost Revolution Bar’s future profits. The profit improvements from the lease provision will boost reported profits but will be excluded from future adjusted profits and so won’t increase them. The impairment of property assets is likely to boost future underlying profits from lower depreciation expenses. To be fair to the company, it has been very clear in stating that future profits will increase because of the provisions and impairments. The half year results contained an exceptional charge of £0.860m for a reduction in value (impairment) of property, plant and equipment assets. There was also a prior year adjustment to these assets of £6.5m for the year ending July 2016. But why have the assets been impaired in the first place? And what might it be telling investors about the health of the company? Non-current assets such as property, plant and equipment are stated on a company’s balance sheet at their original cost less the accumulated depreciation used to spread that cost over their estimated useful life. Companies have to regularly test the balance sheet value for impairment. They do this by comparing the balance sheet value with two other values to estimate what is known as its recoverable amount. Its fair market value less the costs to sell the asset. Its value in use. This is based on an estimate of the present value of its future cash flows. The recoverable amount is the higher of the fair market value or value in use. If it is lower than the balance sheet value then the asset has to be written down to its recoverable amount with an impairment expense. This is the £0.86m exceptional expense in RBG’s half year accounts above. Future depreciation is based on the lower new recoverable amount and lowers the annual expense which boosts profits. 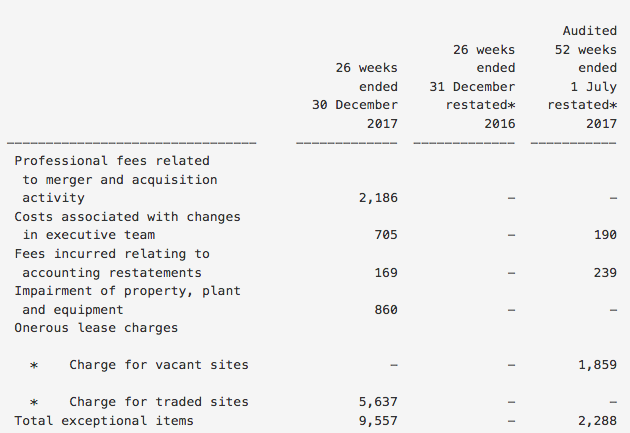 What the £0.86m impairment and prior year adjustment is telling investors is that some of RBG’s bars are not very profitable and are expected to remain so. The benefit to future profits is unlikely to be a massive number in my view. However, the impairment will reduce capital employed and boost ROCE going forward. It will not affect the calculation of cash return on cash capital invested (CROCCI) which adjusts for the impairment by adding it back as it does not reduce the cash that has been spent in the business. (Check out my article on City Pub Group for more on CROCCI). Revolution Bars does not own any of its bars. Instead it rents them under long-term rental agreements. The company has a small number of bars which are loss-making and there is not expected to be enough money to cover the rent bills. Bar contribution is the sales from selling drink and food less the cost of buying the drinks and food and the direct labour costs involved with selling them. The contribution is the money that is available to pay the fixed costs of the bar such as rent. RBG is saying that for some of its bars this number isn’t big enough to cover the rent bills. Under these circumstances, accounting standards allow the company to create a provision for all the future rental obligations of these bars. The amount is £5.5m. Again this will boost profits by reducing the rent expense in the income statement but will not affect cash flows as the rents will have to be paid until the rent agreement comes to an end. Provisions can be quite complicated but here’s a simplified example as to how a provision for onerous leases can impact on future profits and cash flows. Let’s say a shop with an annual rent bill of £100,000 cannot make enough money to cover the rent and is not expected to do so for the remaining five years of its rent agreement. It makes a provision for £500,000 for the remaining rent obligations in full at the end of 2017. During the next five years the rent bill in the income statement is completely offset by utilising the provision. This means that the rent expense of £100,000 in the shop’s income statement is zero and boosts profits or reduces losses by £100,000. The rent still has to be paid and so £100,000 of cash still flows out of the business. By creating a provision, Revolution Bars is expensing its remaining rent obligations on some bars upfront in full and treating the cost as an exceptional one which many analysts and investors are encouraged to ignore. The future benefits to profits will boost reported profits but will be excluded from underlying profits and will not increase them. Investors will be able to see the real effect of the rent being paid in Revolution Bar’s cash flow statement. This will be a negative number in the calculation of operating cash flow. The key message here is what the provision says about the poor health of some of the company’s bars. A loss making freehold pub might be sold to avoid future losses. This is not easily or cheaply done when a business is tied into a lease agreement. Whilst perfectly legitimate, it’s hard not to see this as a form of ‘kitchen sinking’ to give the new chief executive every chance of improving profitability without improving cash flows.